Semaphorin 3E antibody LS-C689441 is a biotin-conjugated rabbit polyclonal antibody to chicken Semaphorin 3E (SEMA3E). Validated for WB. Biotin. Also available Unconjugated or conjugated with Biotin, FITC, FITC, Cy3, HRP, PE, APC, APC, Cy7. 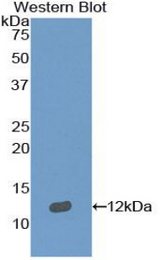 Recombinant SEMA3E (Leu651-Asp740) expressed in E. coli. Western blot of recombinant Semaphorin 3E / SEMA3E. This image was taken for the unconjugated form of this product. Other forms have not been tested.